55 Cancri e -- Transits detected!! Re: 55 Cancri e -- Transits detected!! Wonder how difficult it would be to get spectra. And whether there's a gas tail like HD 209458b. Maybe the remnant of a more massive gas giant planet that's been eroded down? That paper uses the conclusions from Winn et al's original paper here which is based off the original interpretation of the MOST data before they made corrections as described here. Problem is that masses pointed out in the article and in the release differ. What would mean that job made with Spitzer doesn't take into account the characteristics of the star of the article. Sirius_Alpha wrote: That paper uses the conclusions from Winn et al's original paper here which is based off the original interpretation of the MOST data before they made corrections as described here. Looking closer at the press release and papers, this doesn't seem to be the case. My mistake. I'm not sure what's going on. It looks like sloppy reporting. I think that since the two planets are both too low in density to be solid super-Earths without envelopes, they're grouping 55 Cnc e and GJ 1214 b in the same category. But I think we all agree that GJ 1214 b is far less dense than 55 Cnc e.
55 Cnc e is also somewhat more massive than GJ 1214b so there would be more compression. Uncompressed density would probably be a better comparison to do, but harder to figure out. Would be nice to get more RV measurements to pin down the mass better. Well with a density of 4.6 g/cc I would think about a steamy watery planet but with a significant percentage of rock and heavy elements. Right? Edasich wrote: Well with a density of 4.6 g/cc I would think about a steamy watery planet but with a significant percentage of rock and heavy elements. Right? Such a planet would be a "hot super-Pluto". Think of this as a bigger and hotter version of Pluto, in other words, a world composed of rock and ice. Spitzer detection of the secondary eclipse. The results reveal the planet is likely dark and its sun-facing side is more than 2,000 Kelvin (3,140 degrees Fahrenheit), hot enough to melt metal. Spitzer discovered the sun-facing side is extremely hot, indicating the planet probably does not have a substantial atmosphere to carry the sun's heat to the unlit side. Dark because of the Rayleigh scattering? Finds a slightly lower brightness temperature of 1950+260-190 K, still not somewhere I'd like to visit. This is cooler than the prediction of a zero-albedo, zero-redistribution model, but only by 1.4σ. Revised mass and density estimate - still consistent with significant fraction of volatiles. 300 additional RV measurements provide no evidence for a sixth planet, but there is a weak signal at 131 days (low power, not statistically significant). In my opinion the planet is still more a sort of SuperEarth than a MiniNeptune; its mean density is definitely far closer to the Earth one (5.52 g/cm³) than Neptune one (1.64 g/cm³). Also interesting to see the ± 30 days uncertainty about the orbital period of 55 Cancri d despite 23 years of data and 663 data points taken. Don't forget that for a constant composition, the density does not hold constant with increasing mass. Gravitational compression will increase the density. A 2 Me planet with an Earth-like composition will have a density much higher than that of Earth. Judging by the M-R diagram below (taken from the paper), we expect 55 Cnc e to have almost half of its mass in the form of volatiles. This qualifies it for a far more Neptune-like composition than an Earth-like composition. So where is kepler 11 f in this table? beyond the table? Sirius_Alpha wrote: Don't forget that for a constant composition, the density does not hold constant with increasing mass. Gravitational compression will increase the density. A 2 Me planet with an Earth-like composition will have a density much higher than that of Earth. Do you know any formula or empirical equation that describes this compression or the rate of increase of density with mass? For example, are super-earths planets like Corot-7b and Kepler 10-b consistent with being earth-like in composition despite having average density 7-8 g/cm³ or their composition is different from the terrestrial one? It will be interesting to put into perspective this mass compression rate. 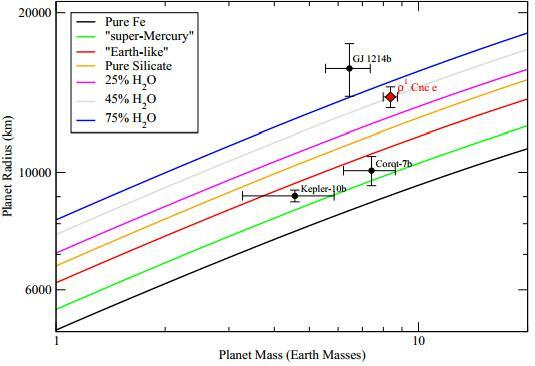 Sirius_Alpha wrote: Judging by the M-R diagram below (taken from the paper), we expect 55 Cnc e to have almost half of its mass in the form of volatiles. This qualifies it for a far more Neptune-like composition than an Earth-like composition. Well, if someone were to plot the function of Neptune-like in that graphic, it would be out of view. In this sense 55 Cancri e is nearer to the Earth-like function. Though the extremely high temperatures indeed could turn into volatiles far larger quantity of material, and if the planets is water-rich it will be indeed host an huge steamy atmosphere, which would give it a more Neptune-like nature.